Mysteries have a tendency to wither away if there is too much built up before coming to the point. 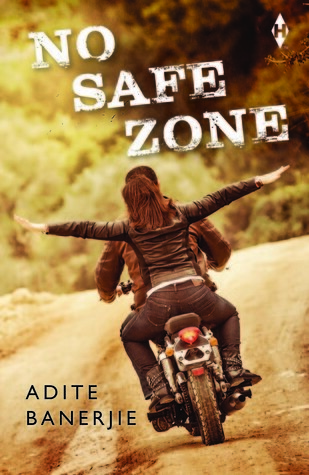 No Safe Zone by Adite Banerjie plunges the readers straight into the nucleus of the mystery and Ms.Banerjie's Qiara Rana lands up in front of a dead body, runs into her ex-lover and has many shady characters chasing her right from the beginning. Qiara is a London-based social activist who is furious when investigating officers tries to blame them for human trafficking. Qiara is still reeling in shock when their benefactor is accused of being involved. But when she goes to find out the truth, she faces many more unanswered questions. Landing up in a wrong situation at a wrong time can be killing but soon she realizes that there are people who are following her and she has no clue as to why and what they want from her. And in this journey lies my first peeve with the story. Her adventures had some very easy escapades. She is tough no doubt about but every time the timely arrival of Kabir stops her from being a firebrand that was part of the charm of Rayna from Trouble has A New Name, another novel written by Ms. Banerjie. But where Qiara lacks in the feistiness, the chain of events that always follow her makes this story an interesting read. One of my favorites in this chain of unfortunate events was the broken wing butterfly tattoos. Here Ms.Banerjie uses symbolism to depict many small things. A child separated from her parents, a child marked for sale and a child yearning to know her past. This part of the novel has some major twists that would make a reader go back a few pages just to make sure they have not overlooked any clues. Such a beautiful line and just a small example of how lyrical Ms. Banerjie’s writing is. Along with that, she has depicted a few social issues and all the while weaving the chemistry between the two protagonists. All along as a reader, I know that Kabir and Qiara had a past. But a man of Kabir’s character leaving a girl cold and dry suddenly did not make sense. I had to know why he had done such an act. So questions like why were these people after Qiara? And what was the picture of her father doing in the victim’s tablet and the relationship between her tattoo and a few missing girls – they sure will keep a reader turning the pages of this novel. Of course, I would. A very well written book with impeccable language and plots and subplots that will leave you with a few nail-biting moments. Sign into Goodreads to see if any of your friends have read No Safe Zone.